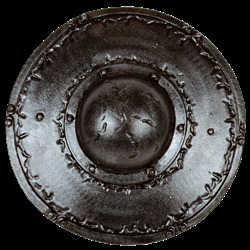 This shield is a classic buckler and is the smallest of the round shields, making it very fast and easy to use. It has a dark and worn look. With its simple design, it can be used for just about any character or theme. This round buckler has a single bar grip on the back, under the shield's boss and can be used with your left or right hand. This single bar grip makes it extremely maneuverable and very, very, fast. The shield is approximately 16 Inches in diameter. This measurement will vary slightly as they are handmade items.